So you want to snap some detailed shots of the moon's surface, but you're over 200,000 miles away and lack any sort of telescope. No problem! At least if you have a bevy of focal length extenders. 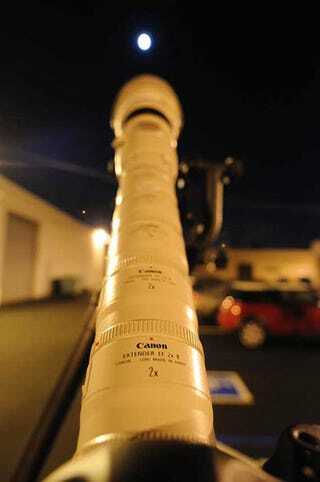 Improvised astronomy! But when they took off a couple, the result was stunning. Update: Reader Matt M. was kind enough to write in saying he was along with the crafty dudes who rigged this super mecha lens (which used a Canon 1D Mark IV), and has a video to prove it. The kids shooting the flick sound like giggly middle schoolers, but the footage is pretty terrific. Maybe just try putting it on mute.